Manufactured of 3-ply, reinforced Hypalon bellow with laminated closed-cell foam backing, factory double-locked to straight galvanized steel flanges along the two long edges. Expansion Joint Covers are factory-manufactured flexible, weatherproof, exterior covers for structural expansion joint openings, and are effective, closures for a wide variety of special applications. Manufactured of a unique 3-ply flexible reinforced Hypalon bellow supported by a durable closed cell foam, which allows for anticipated movement in the structure, and metal mounting flanges factory locked to each edge of the bellow. Field seams are easily accomplished with standard splice kits. Factory manufactured fitting accessories (corners, tees, end terminations, and crossover intersections) are designed for maximum flexibility and are produced using special techniques to ensure clean seam lines and watertight applications. APPLICATIONS: Expansion Joint Covers with reinforced Hypalon bellow withstand the most extreme chemical and weather conditions without leakage. For use with all types of roofing- asphalt, coal tar bitumen, modified bitumen, EPDM, TPO, PVC, Hypalon, and most others. 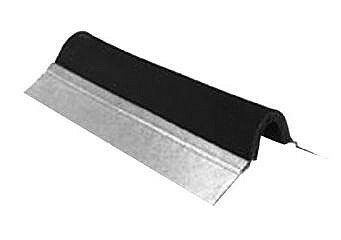 Replaces easily torn non-reinforced EPDM and Neoprene covers and easily damaged, bent, and leaky metal covers.